The metal prototype with every demand from customers such as stamping, punching, deep pumping and specific angle bending are measured and tested according to the measurement of metal materials then apply to each kind of metal and MYLAR. The metal prototype service can be customized during the whole manufacturing process from the mold developing, designing to producing. This technique of the prototype requires highly precision skill, and our R&D team have been trying to expert in every prototyping skills to provide you the best service. 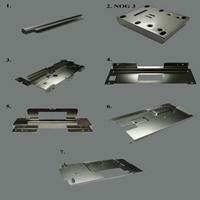 The applications of the metal prototype are diverse, and you can use our quality items in areas such as communication equipments, computer accessories or other related machinery. With the use of the punch machines and different machining processing workings, the processes like tapping and polishing are all well-finished for the metal prototype items, and the products are well applied in a wild range. Contact us and we definitely can meey your needs.